The Lean East team helps organizations learn how to use Lean thinking and tools to remove waste from their processes. We prefer to employ a “learn by doing” approach where we train and coach these methods while engaged in organizational improvement projects. If organizations already have an established improvement process we will work within that process and seek to improve it. But if the organization does not have a robust process in place (and most do not) then we recommend using the Lean East A3 Process Improvement tool. Let’s define a few terms first. Lean refers to a philosophy and management strategy focused on customer value and respect for people. Lean is not about layoffs or running the organization on a shoestring. Lean is continually improving the processes that deliver value to customers by identifying and eliminating waste. Many improvement tools have been used for years (total quality management), but the Toyota Motor Corporation added an important twist for Lean thinking. Lean believes that the workers, not managers or consultants, are in the best position to understand value versus waste and remove the waste from processes. Lean therefore requires an organization to respect all the people who do the work – and not treat them like machines. Many workers making many small improvements every day leads to big results. 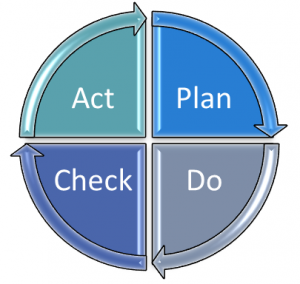 Toyota trains their employees to solve problems using the simple Plan, Do, Check, Act (PDCA) methodology popularized by W. Edward Deming. The PDCA focus is on implementing improvement “experiments” and measuring how they influence key outcomes. First, understand the problem and desired outcome (PLAN), then implement a change (DO), study the results of your experiment (CHECK), and finally adjust the standard process based upon what you have learned (ACT). You may also want to check out our “Ready…Fire!…Aim” post for more information. Toyota also realized the power in simple, concise language. They developed the A3 format so that problems could be shared and reviewed quickly and simply. The term A3 refers to the metric page size of 297 mm by 420 mm – roughly equivalent to 11X17 ledger size paper in the US. An A3 is therefore a standard way to present a problem and the PDCA solution process on a single 11X17 piece of paper. Lean East has further broken down the steps in the PDCA methodology while supporting Lean transformations at multiple organizations. Our format works well for both manufacturers and the service-based organizations we often coach and train. We employ a rubric to help ensure the A3 problem solving team uses an effective process. It is easy to follow the process and identify the next step the team should take in their improvement journey. Our basic process and simplified rubric is below. Why should the reader care about this situation and be motivated to participate in improving? How do things work today? What outcomes are expected for what reasons? What changes in metrics can be plausibly expected? What is the root cause(s) of the problem? Use a simple problem analysis tool to show cause-and-effect relationships. Proposed countermeasure(s) to address each candidate root cause. Predicted results for each countermeasure. A diagram of the future state that illustrates how the new proposed process will work. Note specific countermeasures and expected improvement. Actual result of each countermeasure (experiment). How does the system actually behave with the proposed countermeasures in place? What have we learned that does or does not improve the situation? In the light of the learning, what should be done? How should the way we work or our standards be adjusted to reflect what we learned? What do we need to learn next? To request a FREE copy of our expanded rubric in A3 (ledger size) format please go to our contact form and write, “Lean East A3 Process Improvement tool” in the message area and we will email you a copy. The organizations we work with love the simplicity of the format and having everything important about the improvement project on one page. When an entire organization standardizes on using the A3 Process Improvement process it becomes easier to coach employees and teams, communicate and share successes, and identify new improvement opportunities. Lean East A3 Process Improvement Tool. We appreciate all your comments and feedback. If you are requesting the free template please make your request in the CONTACT section of the website. This will add you to our email list and the template will be sent from this list to everyone who signs up. We have already sent one mailing of the template to over 60 people, but leaving a comment here WILL NOT get the template sent to you!